Training: Sending Business and Bulk Emails. (San Diego, California, USA): Is sending an email a big deal? Is what is in the "From" field, the "Subject Line" and the text of the email really that important? Any thoughts? How about these questions? Have you ever attended a class on how to send an email? How to set up your email? Or have you ever researched and read articles about email best practices? If you have done any of these things, in my book, you are one step ahead of most people. Another point. Have you ever thought that due to the massive amount of SPAM we each receive on a daily basis, that it makes it necessary for us to adjust the way we send emails? Yes? No? Have you ever thought how people who read your email assess your professionalism and credibility based on the way you format the emails you send and by what information you provide the sender? Some people might say there are better ways to send an email, some say it not might matter, some have never thought about it and some simply don't care. While there might be no official procedure how the general public, businesses and organizations should send an email, there are certainly excellent classes teaching how to send emails and there are well-written articles online with excellent tips for sending business emails and sending bulk emails. While this subject is so vast that it probably could be turned into a book, my goal is to try to provide some highlights of some of the best information I have learned from the email and marketing classes I've attended and from my own experiences. In addition, at the bottom of this article, I've listed some links to articles discussing "Email Best Practices". If you've read this far, I feel that simply being aware there are better ways to send emails, is the first step in better communication and being more professional - on the job. I'd like to start by discussing what preceded emails: Printed business letters. The horror! Does anyone remember how to correctly format a business letter? (Examples: Block, Modified Block, Semi-Block, Indented Form are some of the major methods to format a printed business letter.) Is this important? Do you know why standard formats for business letters were created and why there are so few? Readability. By having set formats with key information in the same are of each business letter, this helps to have better communication between business people. If you have an an employee who can write a business letter correctly formatted to a standard business letter look, that person is most likely worth their weight in gold. Interestingly, a standard printed business letter would have most of the following items. Adding the date of the letter. Full address of the company you are writing to. The body of the letter, with paragraph(s). Address the envelope, add postage and mail the letter. What about emails? Do emails seem easier, simpler and have less steps than a printed business letter? Yes or no? Let's take a look. First, you need to set up your email. If it is a business or personal email, remember to put your full name in the "From" Field. By setting up multiple folders for your email list, you can easily go back later that month, year, 4 years in the past or more, and easily find important emails by subject. When you receive an email, after it's read, if it should be saved, save it in an appropriate folder. When you read an email and you know for sure, you don't need the email, then delete it right away. I remember that one company I worked for. They never deleted emails from any clients. They were all saved. That way they always had a history of emails from all their clients. Here are some things to think about when sending an email. Did you send the email to the correct email address? 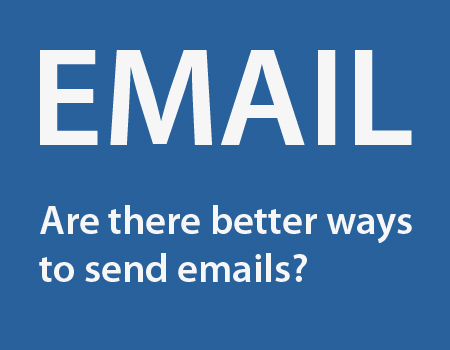 Do you need to send the email to multiple email addresses? Do you need to CC or BCC the email to anyone else? CC: Carbon Copy. This means you are sending the email to someone else to read. BCC: Blind Carbon Copy: Means you are sending it to other people but the main recipient and everyone else do not know that other people are receive the email as well. Do you know that anyone from your own IT department or any recipient of the email can forward it to anyone they want? That what you think might be a "private email" is not actually that private? Note: The date of the email is added by the email program. Good subject lines are important. Make sure the subject line is clear, clear, clear. Explain in the least amount of words what the email is about but be specific. Are you aware that you should try to make sure your subject line DOES NOT look like SPAM? Please remember, a vague subject line looks like SPAM and might be deleted. Avoid one or two worded subject lines. Email subject lines with one word such as, "Hi. ", "Hello", "Quote" or "RFQ" or "Order" or "Purchase Order" look like SPAM. Good Subject Lines look like this, "Tom Jones from Johnson Associates", "RFQ from Tom Jones at Johnson Associates." Or "Purchase Order From Tom at Johnson Associates, USA." Do you have an appropriate salutation? (Example, "Dear Jane" or "Hi Tom".) Several good articles on appropriate salutations are at the bottom of this article. If you don't use a salutation, the recipient might not be certain if the email is actually for them or not. Does the salutation match the email address? Did you write, "Dear Tom" but you actually sent the email to Jane Smith? Did you use paragraphs to make the email more readable? If you don't use paragraphs, your email will be more difficult for people to comprehend. Not using paragraphs is bad communication. Are you listing multiple points? Did you know that a bulleted list of information is easier to read than a paragraph filled with information separated by commas? Did you re-read your email to make sure it makes sense? Is the email written so it's easy to understand? 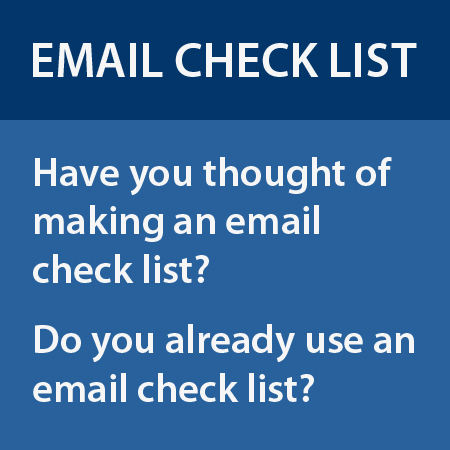 Did you include everything in the email that needs to be there? Is the email grammatically correct? Did you spell check the email? There is a good online article listed at the bottom of this article which includes many good examples of closure lines and examples of closure words not to use. At the end of the email, did you include your first and last name, title, phone number, email address, website, social media links, company name, full company mailing address including zip or postal codes and your country? There are about 196 countries in the world, plus islands, territories, etc. Some people live on ships. Including your country is important. What if one of your customers (in the USA) forwards your email to a potential client who lives in France of India. Don't you think it would be helpful if you included what country your company is based? Did you want to send attachment? Did you write in the text of the email that you sent an attachment? And did you send the attachment or did you forget to send the attachment? Did you send sensitive material in your email? Are you certain that sensitive material can be sent by an email and are you authorized to send this information by email? While it seems that writing a printed letter and mailing it is more complicated and has more steps than sending an email, one can see that sending an email could have as many steps or more, than a printed letter, that is, if good communication is the goal. In my opinion, sending an email shouldn't be taken lightly and having a mental or written check list will help professionals from sending out unprofessional or incomplete emails. One other thought. While a well written email takes time to write for clear communication, can a phone call clear up a problem with less time and effort than a dozen back and forth emails? Then I recommend to make a phone call. And if you need a record of the phone call, you then follow-up the phone call with an email recounting the phone call. One phone call and one follow-up email is probably more effective than a dozen back and forth emails! The best bulk emails are usually sent from a trained team of professionals. 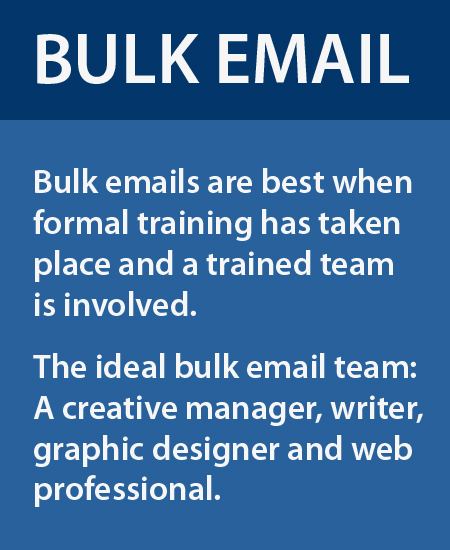 The ideal bulk email team includes a creative manager, writer, graphic designer and a web professional. When setting up a bulk email list, please, use your COMPANY NAME in the "FROM" FIELD. I see a trend that bulk emails are not being set-up correctly. Many businesses and organizations will use a person's name from their organization (a marketing manager or VIP) for the name in the "FROM" FIELD for their bulk email list. This is wrong. Your "FROM" FIELD should be your business name. REMEMBER: People joining BULK EMAIL LISTS are joining an email list because they want to get information from a company or organization. The user is looking for and expecting to receive an email from the company's name or nonprofit's name, in the "FROM" FIELD. An email user will typically NOT know the name of people working for a company. When a company uses a employee's name in a bulk email, the recipient of the email does NOT know the email sender's name and the email now looks like SPAM. Email recipients remember a company or organizations NAMES. Most people DO NOT know the names of employees who work at these corporations or non-profit organizations! And to further beat a dead horse, for example, if you are sending out a bulk email, then please put yourself in the shoes of the people receiving the email. If a person receives an email from John Smith, the email does not sound important. Who is John Smith? If a person in the helicopter industry receives an email and the "From" field says, "Sikorsky", the recipient recognizes the name Sikorsky, and will most likely want to look at the email. Good subject lines are important. Make sure the subject line is clear, clear, clear. Explain in the least amount of words what the email is about. Subject lines which are too clever (Example: Wow. Can you believe this?) or have a one word subject line (Quote. Brochure. RFQ, Inquiry and etc. ), look like SPAM and the email recipient and will most likely delete the email. One has to decide if your email will be in text or will look like a web page. If your email is going to look like a web page with pictures, then it would be best to have a graphic designer and a web professional involved in your bulk email process. I would always recommend to have all people working on bulk emails to take formal training on the sending bulk emails. If your company can't afford to train your team on bulk email best practices, then I'd get online and do your own research on the bulk email best practices and I recommend you do all your learning during your working hours. I also recommend a for-pay online training company called Lynda.com. They offer 24/7 training (by watching their videos) on subjects such as bulk emails, marketing courses, Word, Excel, Grahpic Design, Web Design, IT courses and many types courses for business professionals. The nice thing about Lynda.com is you can watch videos any time of the day and you can watch a video over and over again. The annual pricing is not bad and hopefully your employer will pay for this service. There are many bulk email companies around the world. Find one that works for you. The one I have successfully used for years (based in the USA) is called Constant Contact. They are a very good company, they offer free training and have excellent customer service. Constant Contact also has very good statistics on how many people are opening your bulk emails, how many people are clicking on links in your email and things of this nature. Constant Contact can help you keep a legal email list. More about this several bullet points down. At the beginning of ALL BULK EMAILS there should be the statement, "You are receiving this email because you signed up for it. You may always unsubscribe. A link to unsubscribe is at the bottom of this email." Also, forward this email to a friend link is always important to have at the top of the email. At the bottom of your email you must always have an "Unsubscribe" link. And remember, due to the CAN-SPAM Act of 2003 (U.S. Government), you may NEVER add anyone to your email list without their permission, no matter if they are a good customer and "you know" they won't care. That means this, if you want your customers to join your email list, you may email them one at a time and or call them by phone and ask them to join your email list. You can ask them to join your email list on your brochures, website, invoices, packaging slips, instruction manuals, and through your customers service and sales force and etc. But you are not allowed to add your all your customers to a bulk email list without their permission. If you already added all your customers to an email list, then from what I understand, you need to send them an email stating that they must opt-in to your email list and if they don't, they'll be deleted from your email list. And once you do this, you'll have a legal email list. With a bulk email company such as Constant Contact, you can easily send a bulk email asking your customers to opt-in to your email list. The content should be good content. What is happening with your company, industry trends, coupons, etc. If you only have enough good content about once a month, then your bulk emails should be about one per month. The rate of sending emails per week or per month depends upon your company and what you are offering them in your emails. At the bottom of your email, I would always have your full company name spelled out in text, with your full company mailing address, country name, email address, phone numbers and links to all your social media pages. If you send too many emails from your company each month, then people might not be interested in your emails any more and you'll start having an lower open rate and/or they will begin to delete themselves from your email list. One important thing to note, is that even if people don't open your bulk emails all the time, that there is value in branding your company name to each email recipient. For example, I am on an email list for coupons from several stores and restaurants. While I usually never open their emails, I keep all their emails in a coupon folder and when I'm ready to buy, I simply go to my coupon folder and look for their emails and find their recent discounts. Also seeing their company names in the "From Field" each week, keeps their company name present in my mind. The industry standard for the open rate for bulk emails is about 20%. This is why excellent subject lines are important, the content of the email should be useful and this is why you should try to limit the frequency of your emails. If your company has an open rate of 20% or more, you are doing something right with your bulk emails. I hope this article helps you. And I've listed several links below to some online articles which I like, on tips and tricks on sending out better emails. Please remember, if you need more tips for email best practices, look up more articles online and/or take a class!